One daughter’s small step toward helping her mother turned out to be a giant leap into the business world — a place that’s sink or swim. Tekamah, Neb., native Kelly Kleen and her business partner and boyfriend, Sammy Casella, originally from Swedesboro, N.J. created WetSteps. 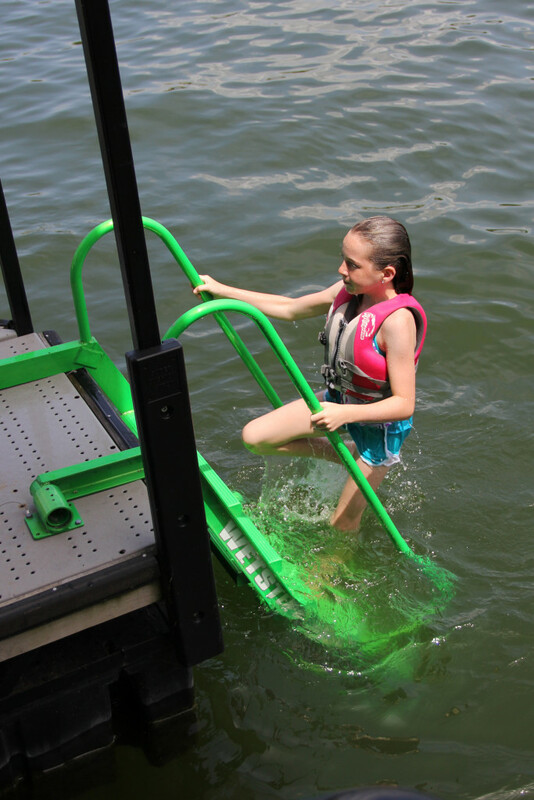 Their company is based in the Lake of the Ozarks, where they manufacture and design dock ladders and accessories. Their purpose is to make the dock and boating lifestyle easier and safer for their customers. The business was born after Kleen watched her mom’s own battle to enjoy the lakeside lifestyle while visiting from Nebraska. “My mom’s foot and knee issues were making it a struggle to get out of the water. The tiny rungs on the old dock ladder hurt her feet, and the straight and vertical ladder made it hard to climb out,” said Kleen. Kleen drove around the lake in attempt to find a more convenient ladder device. Casella started tinkering in a tiny shed at their Sunrise Beach, Mo., house. He created a simple aluminum dock ladder with wide, angled steps and hand rails — WetSteps. Casella knew about rebuilding things. Growing up, he built and raced Midget Sprint cars with his father. “I hated paying people to fix our race cars, so my dad and I bought a welding machine. I taught myself how to weld,” he said. Casella and Kleen couldn’t have predicted at that time early in the development the impact their product would have on lake-goers. People like, Quinetta Rutledge. Rutledge could relate to the struggles and pain Kleen’s mother experienced. The now 65-year-old spent childhood summers water skiing and swimming. As she got older, she taught swim lessons at the YMCA and even played a mermaid every summer in the Lake of the Ozarks show, Aquarama. “I had a long tail, and as mermaids we would swim along and be part of the show. My claim to fame is, I’m a mermaid,” she laughed. A decade ago, Rutledge’s lifestyle started deteriorating. Multiple Sclerosis took control, causing her to lose partial vision, wear a device on one leg and use a walker. At one point, her husband concocted a hydraulic hoist to lift her in and out the water, but it wasn’t ideal. She was forced to give up life in the water and watch her grandchildren from the dock. That is until she heard about what her lake neighbors invented. WetSteps’ patent was finalized in 2010. 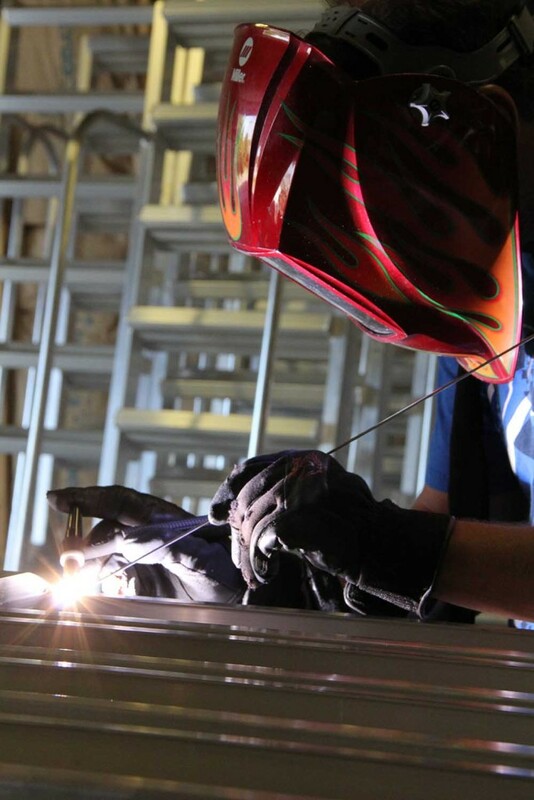 The company has since moved into a larger facility and employs a seven-man team of welders and fabricators. They build dock ladders, high dives, handicap accessible ramps and other safety-based dock accessories. They’re relatively lightweight and made of aluminum, Casella said. The products are sold in 10 states, come in bright colors to match boats and docks, and can be outfitted in sports team colors and logos. Adam Mistler, owner and manager of Concrete Welding and Dock Supply (CWD) in Osage Beach, Mo., has been selling WetSteps products since they first came out. He said there are other products with similar design on the market, but he doesn’t sell them. Mistler has seen “a significant increase in sales” — from just a few to more than a hundred a year. Mistler likes the color choices and the quality of the product. According to Kleen, sales have doubled each year since they started the business. 2012 was so successful, she quit her job selling boats — a career she started in 2005 after moving to Lake of the Ozarks. Steve Wilbur of Carter Lake, Iowa purchased a WetSteps ladder last summer. “I grew up on the water, and as a kid I watched my parents go through so many dock ladders,” he said. “I was skeptical at first because there is nothing in the industry like it.” But he was sold. “It’s a made-in-the-Midwest product, too,” he said. The couple takes pride in the fact that WetSteps products are made in the United States. They had an opportunity to produce elsewhere for less money, but chose to keep the business local. Their neighbor across the lake, Quinetta Rutledge, is one of those customers. She asked for a WetSteps ladder for her birthday. Now, she is always the first one in, weeks before others will even dip their toes in the cold water. “Yes, I’m that mermaid once again,” she said.